There's nothing like coming in from a tiring day and lying in a relaxing bath allowing the warm water to rejuvenate your body. A bath pillow can increase your relaxation and comfort in the tub allowing you to unwind. Because bath pillows are quite a simple invention, it means that many manufacturers have made their own which has made the buying decision harder. As a result, we’ve created this buying guide to show you the best bath pillows. Tranquil is an independent brand based in England and have introduced several high-quality products into the market, with one being this lovely bath pillow. The bath pillow can easily be maintained and can be removed by pulling the suction cups away from the surface of the bathtub, allowing you to store it away when not being used. It can be cleaned by just wiping with a soapy cloth, rinsing and then leaving to dry. The pillow is made using memory foam material and has a waterproof soft plastic coating. The memory foam contours to the shape of your neck and head while the coating is comfortable to lie on as the cushion cradles your neck, head and upper back. Also, included with the pillow is a money back guarantee so if the pillow doesn’t suit you, it can be returned, so there's no risk. This is also because of Tranquil trust the quality of their products. Blue Coast collection is a company who have specifically designed durable and high-quality products using premium materials. The Bonnieu bath pillow provides great stress relief and has plush, comfortable padding which contours to the shape of your head while you enjoy your bath. 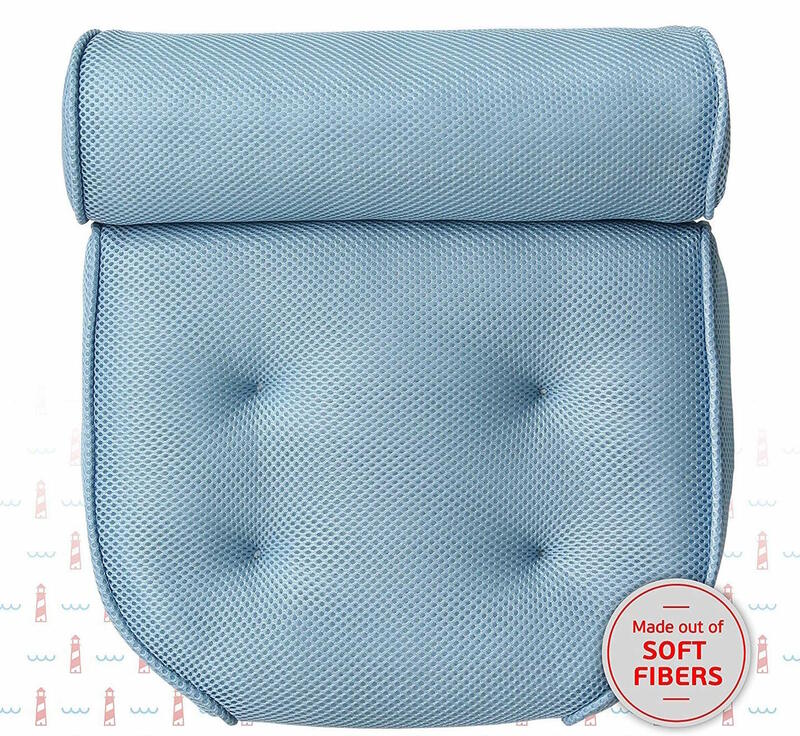 The town panel design ensures that the round top can rest and support your neck and head, while the main section of the pillow supports your back and shoulders. No rubbers or plastics are used to make this product and only uses extra soft fibres that are soft against the skin. 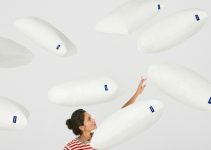 The pillow attaches to your pillow with four inbuilt suction cups which are heavy duty so they won’t slip out of place. The pillow can then be removed with ease once you have finished your bath, and it can be hung on almost any surface including ceramic tiles or shower doors. This product isn’t just limited to baths, but can also be used in Jacuzzis and hot tubs for added support and comfort. Blue Coast also supply a 1-year warranty with the product highlighting their belief that you will love the product. This entitles you to a 100% refund or replacement if you’re not happy with the results of the product. The Livewell Bath Pillow has been renovated and improved to an even higher standard to retain its place amongst the best in the market. The bath pillow has an extra thick 10cm padding with separate headrest support that also has a shoulder width backrest to increase the level of comfort. The pillow has four heavy duty suction cups which ensures that the pillow stays in place. All you have to do is use a clean and dry surface, then add just a drop of liquid onto each cup and then apply it to the bath surface using pressure. The bath pillow uses mesh technology and also has a hook built into the surface of the pillow which means you can hang it to dry when not in use which will help to avoid mould and mildew. Also included is a Loofah sponge as a free gift with each purchase to improve your overall bathing experience. The pillow is ergonomic to fit the shape of your bath and also comes with a 100% satisfaction guarantee to ensure that you are entirely happy with the results of the product. The Relux bath pillow has been designed to provide extreme comfort while you’re in the bath. 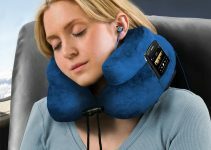 It's built using ergonomic foam which works to eliminate neck pain and is portable so you can carry it even when you travel. 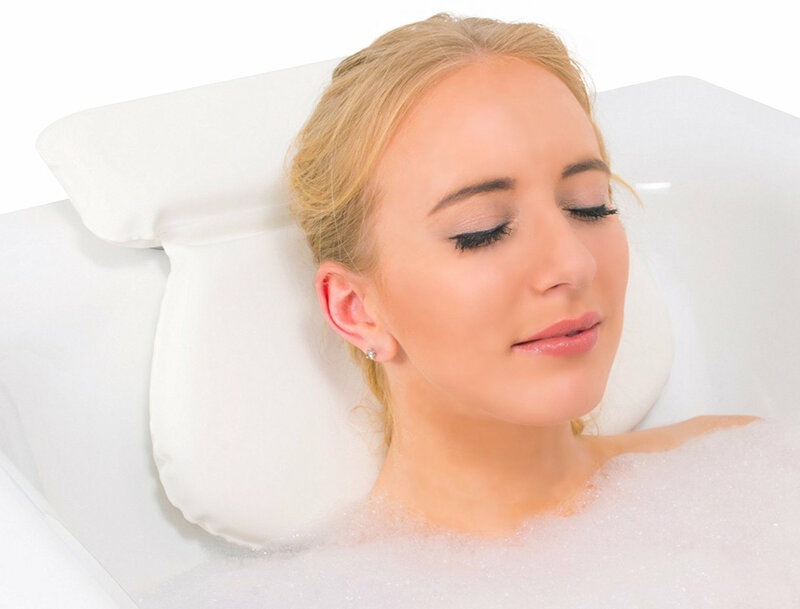 The pillow features numerous inbuilt suction cups on the back which firmly secures it in place on the bath, so you don’t have to worry about your head touching the cold surface of the bath. The reinforced design lengthens the life of the product so the material will not split or suction cups lose effectiveness. The pillow also has extra padding so you can experience ultimate relaxation while you use the bath. The pillow fits onto all bath types and can be used by adults and children as well of all body shapes. The outer cover is waterproof so you can easily clean it and once you've finished using the pillow, you can easily detach it from the bath and store away when not in use. It is backed by a 100% customer money back guarantee, so you have full peace of mind when you purchase the pillow. This Maison & White bath pillow allows you to transform your bath into a home spa with ease providing you with outstanding comfort as you unwind. 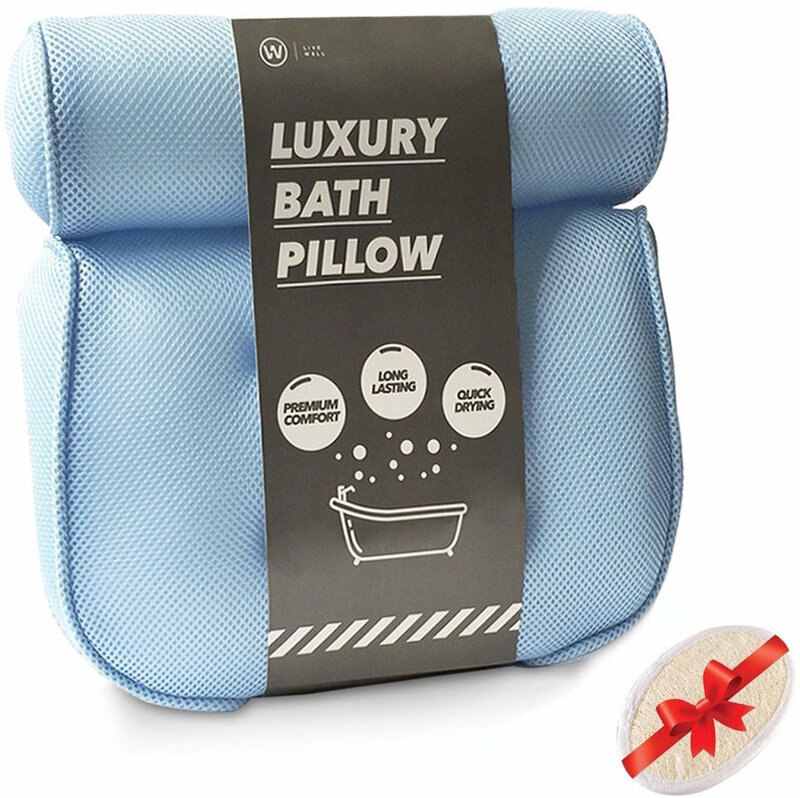 The pillow is ergonomic so fits most bath types and has a sponge filling and PVC cover that is not only durable but also quick drying and easy to clean. The bath pillow uses seven high strength suction cups that create a secure seal against the surface of your bath, so slipping is at a minimum. The design also makes it odour resistant and antibacterial. A common complaint about bath pillows is that they’re too firm which can make them less comfortable and can also lead to splitting. This pillow is soft and squishy so you can sink into the fabric staying cosy. This is slightly cheaper than the alternatives, but despite not having the added features of products higher on the list it does the basics well which is the most important thing. The pillow is easy to clean, and all you need to do is remove from the surface of the bathtub and wipe clean with soap and a cloth, rinse and then leave to dry naturally. What is a bath pillow? A bath pillow is exactly what it sounds like, a pillow that you can use in the bath. It’s different to a regular pillow because they’re made from water-resistant materials to retain its shape and quality. Suction cups are also attached to the pillow so it can grip against the bath to stay in position because the surface can become slippery due to the water and soap. You can spend more time in the bath if you’re comfortable and studies have determined that soaking in a hot or cold bath can bring many health benefits. These benefits can include reducing cold symptoms, reducing muscle soreness, reducing the impact of skin problems and lowering the effect of arthritis. These listed benefits can’t occur if you’re getting in the bath and spending 5 minutes and then getting out. You need to spend more time to feel these effects, and the best bath pillow will allow you to spend more time because you will be comfortable. This is especially relevant if you work a long hour job that is physically demanding, which can lead to muscle pain and soreness developing all over your body. Having a long bath with a comfortable bath pillow will not only help to reduce lactic acid levels and improve blood flow which reduces soreness recovery time. A bath pillow will also allow you to stay in the bath longer which will allow your muscles to recover quicker. If your body has the wrong posture, then this can cause damage and harm to your spinal cord which can lead to long term back pain. So, whether you’re in the bath, sitting in a chair or merely standing, you need to maintain correct posture. Bath pillows can relieve the pressure from your spine which not only keeps you more comfortable but reduces the risk of pain developing, which also means you can spend a more extended amount of time in the bath. Having a bath is a relaxing experience for the body, but the level of relaxation quickly decreases if it's putting stress on your body. A bath pillow works to increase comfort which leads to more stress relieving bath calming your muscles and releasing tension. Health professionals have also stated that it can reduce blood pressure levels which are essential for living a healthy life. There is a range of different kinds of bath pillows depending on the users' needs and specific requirements. Memory foam bath pillows are one of the most common types available on the market. These pillows are incredibly soft and contour to the shape of your neck and head providing exceptional comfort. Like all memory foam, it's heat and pressure sensitive and then reverts to its original shape once you have finished using it. These bath pillows are filled with a jelly-like liquid which is a little bit hardened and solidified, and they can also be put in the fridge or freezer to give you a cool and refreshing feel once you use it in the bath. These come in a range of colours and sizes to suit your needs. The pillows are readily available and are filled with either cold water, warm water or air, and this allows for the firmness of the pillow to be adjusted to your needs. I.e. if you want a firm pillow then you add more filling, and if you want the pillow to be softer, then you remove more filling. Because they are inflatable, they are compact when not in use so if you’re a frequent traveller, they won’t take up too much space in your luggage. The final type of bath pillow is bead filled bath pillows which have microbeads that work individually to adjust to the shape of your body to contour to the shape of both your neck and head. These pillows are very durable and long lasting while also being comfortable to use over a long period. Several factors will affect your final purchasing decision for the best bath pillow. Cleaning care – You need to ensure that your chosen bath pillow can be easily cleaned; however, most bath pillows consider this when they’re designed. These bath pillows can either be washed by hand or are machine washable friendly. Some bath pillows only support the head, whereas the best bath pillows will provide additional support to the neck and shoulder for added relief. Of course, the second option is the better solution, so it’s important to consider this. When you choose a bath pillow, you should make sure that the cover can protect and resist specific types of substances such as bacteria, mildew and mould which can irritate your skin and lead to disease and skin conditions. If the bath pillow can’t resist these types of microbes, then it will begin to give off an odour especially because bathrooms tend to have more moisture than other rooms in the home. There are many different materials that bath pillow covers are made of ranging from PVC to polyester. The fabric you choose will be determined by what surface you find most comfortable against your skin as you may be using it for long periods each time. Be sure to select a material that you'll find easy to remove and clean. Some bath pillows are designed to promote airflow in and out; this is done by constructing many holes within the material which work to regulate your temperature. This also makes it more hygienic as it wicks away sweat and moisture. The type of filling varies from pillow to pillow but will ultimately come down to personal preference. Memory foam provides the most comfort while also contouring to the shape of your neck and head. The quality and quantity of suction cups are essential to consider especially if you opt for the fillable version of a bath pillow because the more significant the weight load the more pressure the suction cups come under so you need to make sure that your chosen bath pillow has suction cups that are strong enough. Weak suction cups will slide and move around too much so you will keep having to adjust its position which will mean your bathing experience will be less relaxing. A standard bath pillow should have at least two suction cup. Although you’d think that more suction cups equals better stability, it depends on the quality of the cups which determines how well they will stick to the bath. So you can see that a device as simple as a bath pillow can make a massive difference to your bath experience for a very affordable cost. You also now know the critical factors to consider before making a final decision whether that be the suction quality, type of filling or bath compatibility. Take your bathing experience to the next level today.